As the quarterfinals at Euro 2012 have come to a close on Sunday night, the semi-final between Italy and Germany will be a chance to get revenge for Jogi Löw’s team for defeat at the same stage at the 2006 World Cup in Germany. Italy meanwhile can cement their status as bête noire for German football. A history. Both countries met at a World Cup for the first time in 1962 in the group stage where a 0-0 draw was the result. Brian Glanville wrote about the match that both teams danced around each other like cautious boxers. There was ‘little variation of pace’ and the game de-generated into some kind of ‘tank battle.’ Germany went through to the quarterfinals where they lost to Yugoslavia 1-0. It was the third successive time both countries met at this stage of a World Cup. It took 8 years for both teams to meet again in a World Cup match, this time it was the semi-final, played in Mexico City. In German football history, this game has become the ‘Jahrhundertspiel’ (match of the century). It was not a particularly spectacular game. Italy scored as early as the 8th minute and did everything to prevent Germany from scoring. This did not quite work out as Schnellinger equalized almost at the final whistle. Extra-Time. This time, Germany scored early through Gerd Müller, and Italy equalized. Just before the end of the first period of extra-time, Italy went ahead and again Gerd Müller scored to make it level again, 3-3. It was not enough. Just a minute later Giovanni Riviera scored the winner for Italy. It proved too much for Germany and they went out of the tournament. Italy were in the final where they deservedly lost for their defensive approach to Brazil, 4-1. 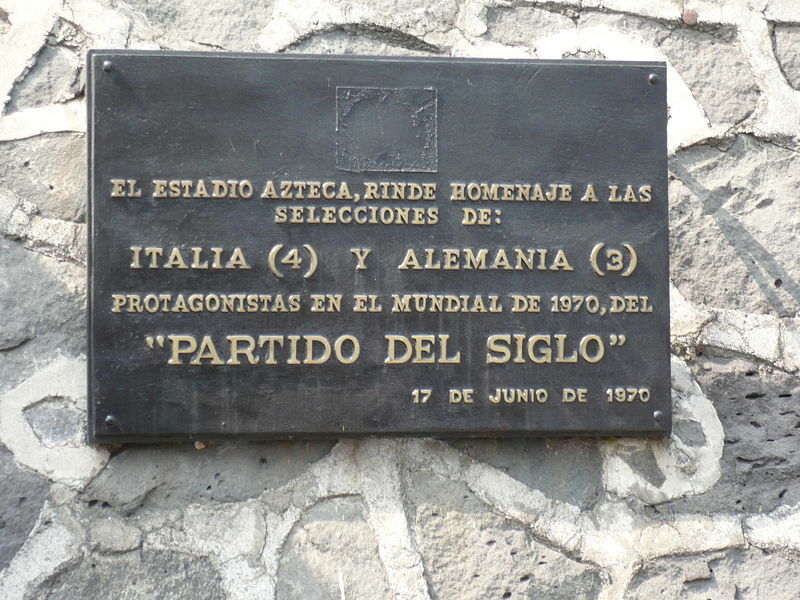 Today a plaque out side the Aztec Stadium in Mexico City remembers this game. Only 8 years later another World Cup saw Italy and Germany playing each other in the group stages of the tournament. It was another dull 0-0 draw. Franco Causio accused the Germans, the World Champions, to have built ‘the Berlin Wall in Argentina’ and Glanville further pointed out that the German attitude was ‘cravenly defensive.’ Quite how Germany developed from one of the most exciting teams of the early to mid-1970s to defensive bullwark is another story. Only four years later Italy beat Germany in the World Cup Final in Madrid. In the run of the tournament have given away all their credit they’ve earned throughout the previous decade and during the European Championship in 1980. They have won the final 2-1 against Belgium and were without a doubt the best team in Europe. Three finals between 1972 and 1980, two of them successful, only 1976 they were runners-up after Panenka’s coolly chipped penalty in Belgrade. It is clear that something had gone wrong in German football. The group stage was overshadowed by the ‘disgrace of Gijon’ between Austria and Germany in which the latter scored an early goal after which both teams were accused to have stopped playing football. It was a ‘non-aggression pact at the cost of Algeria who had beaten Germany 2-1 in the opening game but had to go home after this scandal. Worse was to come still. After Germany scraped through the second group phase with a 0-0 draw against England and an unconvincing 2-1 win over Spain, Jupp Derwall’s team were in the semi-final where they would meet France. This game more than anything else showed the cynical approach Germany had taken to the game. Why Schumacher was not sent off, is unclear. The referee has not seen the incident which puts his performance into serious doubt as Patrick Battiston went after the ball and play moved towards the German penalty area. France were shattered but nonetheless showed a heroic fight. The game ended 3-3 after 120 minutes. For the first time penalties had to decide a World Cup semi-final. Germany made it through to the final. Italy convincingly beat them 3-1. The game was not a promotion for football. Germany could not and did not want to go and play positive football as they did when Helmut Schön was national coach. Italy controlled the game and deserved the title. While Germany’s World Cup record so far showed only two draws and two defeats, in the European Championship in 1988 held in West Germany and 1996 played in England, Germany could on both occasions not beat Italy. Instead two more draws were added to the record. The latest chapter in this history of footballing rivalry came in 2006 when Germany hosted the World Cup and met Italy in the semi-final at Dortmund. It was a classic encounter of football going form end to the other of the pitch over the whole of the 120 minutes. Italy dominated but Germany did not give in. Many observers feared a penalty shoot-out. Germany have reached the semis by beating Argentina 4-2 from the spot, while Italy beat Ukraine in 90 minutes 3-0. Just when that thought had settled, Italy scored. A corner was not well defended and the ball came back to Pirlo. He dummied a shot once, twice before passing to Fabio Grosso without looking at him. Grosso did not look either and curled a shot from the right side of the German area into the far left corner of Lehmann’s goal. Germany had to open up to score and it was one of these counterattacks that allowed Alessandro del Pierro to add another and finally break German hearts. To Italy’s credit, they deserved to go through as they were better, their squad had more depth and was far more coherent than the German team. On top of that the Calciopoli scandal seemed to have induced a siege mentality, which helped Marcello Lippi to focus the team on the task at hand and forget about the outside world. It paid off. Italy won the World Cup on penalties against France. Germany are the favourites to win the Euro 2012 however, the team have to raise their game in order to overcome Italy. So far, the record is negative with 4 draws in all competitions and three defeats. This tally excludes any friendlies. Germany could be punished once more for missing goal scoring chances like they did against Greece where they should have been 3-0 up before Lahm finally scored the first goal after 39 minutes. Italy are centred around Andrea Pirlo, their master in midfield. However, their forwards have let them down. Antonio Cassano, Mario Balotelli and Antonio Di Natale have so far scored just once. Mario Gomez’ tally comes to three, Miroslav Klose and Marco Reus have also scored. The team of Jogi Löw appears to be much more settled and balanced as it was two years ago. Most of all, it has matured. Gone are the days of hooray style counter attacks like against England in 2010 in the second half. It is questionable whether Germany will enjoy as much of the ball as they did against Greece. Their stamina and guts will be much more in demand come Thursday. The same has to be said about Italy. The game will provide for both the sternest test so far in the tournament. Very nice piece Christoph. I think the midfield battle is going to be fascinating. On your side, Schweinsteiger, Kroos, Khedira, and Ozil have been outstanding so far. On our side, Pirlo and Marchisio have been superb, but who will play alongside them? De Rossi is slightly injured so perhaps Nocerino and Diamanti will get a start ahead of Montolivo and Thiago Motta. As an Italian, I’m happy that history is on our side, but as a football fan I’m worried about Germany’s momentum. Good luck! Indeed history is on Italy’s side but every series comes to an end. I’m surprised you haven’t mentioned Balotelli. Is he just a ‘King of Comedy’ (R.E.M.) or is he really a good striker? In my opinion Pirlo is the main man to take care of. Kroos should get more playing time as Schweinsteiger is not fit and looks increasingly tired.